32 Piece NFL Pocket Pro Helmet Set in Black Wood Display | Sports Memorabilia! 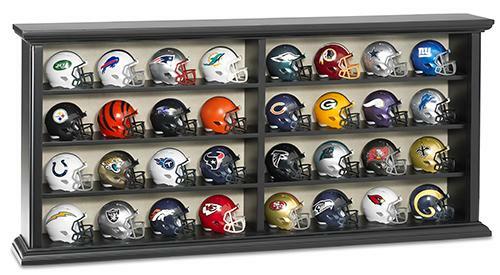 32 Piece NFL Set in Black Wood Display Case by Riddell. Every current NFL team is included in this stunning Pocket Pro Set. These pocket size helmets are displayed in an attractive black wood case with sliding acrylic doors for easy access. You'll be the envy of your friends. Helmets are 2" tall. Case measures 23.75"w x 11"h x 3.5"d.